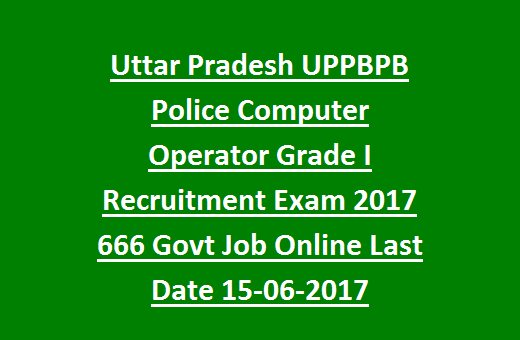 Uttar Pradesh Police Computer Operator Jobs Recruitment Exam 2017: Uttar Pradesh Police Recruitment and Promotion Board UPPBPB is released new notification for the recruitment of Computer Operator Grade I posts in UP Police Department. There are total 666 vacancies available in this UPPBPB Recruitment 2017 of Computer Operator Posts. This Computer Operator Grade I vacancies are direct recruitment of UP police department. Last date of submitting application form online for this Uttar Pradesh Police UPPBPB Computer Operator Vacancy Recruitment Exam is 15-June-2017 up to 05:00 PM. The selection for UP Police UPPBPB Computer Operator Jobs Recruitment 2017 is will be in two stages such as Online Exam and Computery Typing Test. The eligible candidates can apply online by using Uttar Pradesh official web site only at www.uppbpb.gov.in. from 16-05-2017. For more details regarding UPPBPB Recruitment of Computer Operator Jobs eligibility criteria, Technical skills, Pay scale, age limits, educational qualifications please see below. There are total 666 vacancies available in Uttar Pradesh Police department recruitment under UPPBPB. This recruitment is under CCTNS Scheme of Uttar Pradesh government in 1520 police stations. Reservations are also available as per the government norms or Uttar Pradesh. Reservations are applicable only for the local candidates of Uttar Pradesh. For all the candidates must have qualified 10+2 Examination with physics and Mathematics stream. The candidates must have the DOEACC or NIELIT with "O" Level or the candidate must have studied diploma in Computers or Electronics or Degree with computers or Engineering discipline in computers. The candidate must have born in Uttar Pradesh. As on 01-Juy-2017 lower age limit is 18 years and upper age limit is 28 years. For reserved candidates as per government norms relaxations will be given. For this recruitment application fee is fixed for Rs.400/-. Selection for this UP Police Computer Operator Grade I recruitment is held in two stages. Online written test will be conducted and followed by a computer typing test. Online test will be conducted for 200 marks objective type multiple choice exam. Minimum qualifying marks are 80. Those who are qualified written test they are only eligible for the Computer Typing Test. The candidates have to attend the typing test in Hindi/English. For Hindi must have type 25 words per minute. For English 30 words per minute. Must have 80% accuracy in typing test. These details will be available on official notification which is yet to be released. The eligible candidates can apply online from 16-05-2017. Before applying please see the official notification. Candiate must have the required computer knowledge. Click here to apply for the UP Police Recruitment and Promotion Borad Computer Operator Vacancy Recruitment 2017. 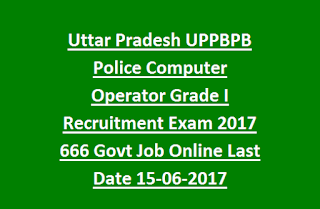 Click here to see the unofficial advertisement of UPPBPB Police Computer Operator Grade I -Recruitment. Please share this UP Police Computer Operator Grade I Recruitment 2017 article to your lovable friends through online via social web. If you are already a computer graduate then I think not necessary of CCC. Please confirm the same in official notification.